The Zephyr Quartet Dit in Australië vermaarde kwartet treedt op zaterdag 17 februari in KuuB op, vanaf 20.00 uur, voor een concert van circa 5 kwartier. Ze zijn toevallig in Nederland omdat ze volgende week meespelen in The Beginning of Nature van het Australian Dance Theatre in het DeLaMar Theater in Amsterdam. Dus een unieke kans om met dit prachtig spelende kwartet kennis te maken. Voor meer informatie, zie onderstaand. Australia’s award winning, genre-defying Zephyr Quartet will share an eclectic mix of music from their home-country. Featuring their own compositions and arrangements of some of their favourite contemporary music, join them for a unique and intimate musical journey. 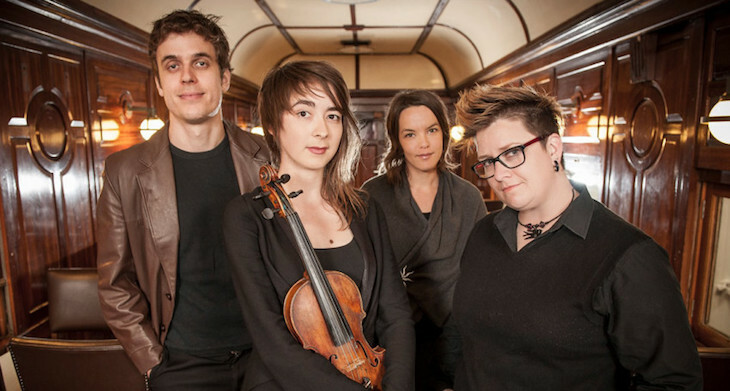 Zephyr Quartet are Australia’s leading genre-defying explorers of dynamic cross-artform music focussed collaborations, an award winning string quartet whose musicians also compose, arrange and improvise. This unique skill set together with Zephyr’s open-minded approach allows them to skilfully traverse musical worlds and gives the quartet its own distinct voice. ​As well being passionate champions of Australian artists since their inception in 1999, Zephyr works with renowned artists from across the world, sharing the stage with musicians such as luminary Jóhann Jóhannson, minimalist cult act Stars of the Lid and collaborating with indie artmusic polymaths such as JG Thirwell and Jherek Bischoff. A firm believer in the power of the string quartet as a medium to communicate and explore complex relationships between society and art, Zephyr has achieved an enviable reputation for artistic excellence, innovation and audience development as well as for being ‘Arguably Australia’s most lateral thinking and inventive ensemble’ (Music Australia).